In many libraries, amazing automated transportation and robotic retrieval systems are behind every book you receive from your librarian. Peek far behind the walls of the familiar reading rooms into the seemingly endless rows of stainless steel shelves, data centers, and intelligent servants that deliver humankind’s collective knowledge. 154 miles of shelving hold over 6.5 million volumes of books and periodicals in this new storage unit where cranes navigate among the uniform boxes. One petabyte (1000 TB) data is stored in this audiovisual library on 1200 IBM Tivoli LTO tapes, retrieved by this automated mechanism upon online request. Millions of newspapers are stored on racks at the British Library’s National Newspaper Building. The newly built storage void holds 60 million newspapers and periodicals spanning more than three centuries. The temperature and humidity controlled store is operated by robot cranes and can retrieve newspapers from any time and date. 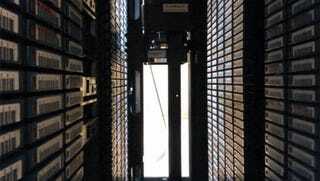 NCI is capable of holding 9520 tapes, storing between 13.9 uncompressed and 28.5 compressed Petabytes of data. The time taken for the system to deliver data after a user request depends upon the location of the robot that retrieves tapes, availability of a free tape drive, and the location of the data stored on the 800m plus length of tape. Typically, this delivery occurs between 30 seconds to a few minutes. An almost 30-year-old automated electric railway transportation system with 50 carts. The new Automated Storage and Retrieval System (ASRS) uses three cranes to store and retrieve bins (a total of 4,200 bins) filled with items such as books and historical artifacts. The system has a capacity for approximately 420,000 items. The “bookBot” glides down a row of drawers. 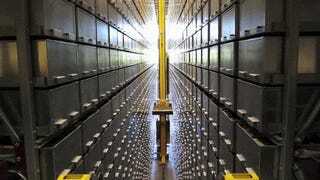 The automated book retrieval system is just one of many innovations in the new, state-of-the-art facility. The Automated Retrieval System (ARS) delivers on-demand access to hundreds of thousands of item. The Automated Storage and Retrieval System (ASRS) claims to allow readers access to their desired materials within minutes.